Last night the Speakers finished off the Bastards in true championship form by taking games 4 and 5. My team battled as usual; but, I was up against a steam roller of great rolling. but more importantly, better players. Brian’s continued Draft success finally paid off as homegrown’s like Rizzo, Machado, Bryant, and even Mookie woke up in game 5 – as they all came through. Also the guys that were filtered in from THE ROLLING MATLOCKS were key in the series – Price, Kinsler and Cespedes. At least the best drafter of young talent in our league picks last every round next year, but it probably won’t matter as splits are splits and stiffs are stiffs to some. I’m still bitter he said Cody Bellinger’s name the round I was finally taking him last year. Totally my fault, I waited too long. You can’t wait on Brian. He will pounce on the future!!! I’ll wrap up with a story about him pouncing on a little known guy way, way back in the day by the name of Albert Pujols. A decent player, who oddly enough in this league only ever played for the Speakers. Well a former teammate of his on the Speakers, David ‘Big Papi’ Ortiz, played his final OOTL game last night. Papi helped the Speakers win a title or two, as well as the Tsunami’s and the Bastards win theirs. Brian and I think that no player has won more in the OOTL than Big Papi. 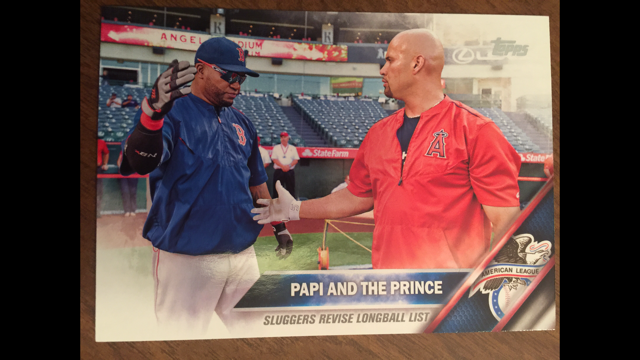 Well Big Papi and I congratulated the new Champ with this card. It was a perfect ending an OOTL career, World Series title run and another OOTL season. Congrats again Brian!!! PS – I just remembered my little pep talk email I sent out prior to the playoffs starting. Man I’m stupid. Lol. Just kidding. The Browns resumed their series against the Bastards today needing just one win to go to advance. They did not get it. Game 7: Lester v Phelps. With 2-outs in the 1st the AB’s got back-to-back solo shots from Ortiz and Stanton. This time the Browns showed a bit of a fight getting a Single from Reddick followed by a 66 from Dozier… which, of course, was promptly turned back to a double. With 2nd & 3rd Abreu brought a run in with a ground out and Belt tied it with a Sac fly. But, it didn’t stay tied for very long. Ozuna opened the bottom of the 2nd with a single and Gattis made it 4-2. Dozier had another homer turned back in the 4th but after Ramirez doubled in the 6th Dozier’s third double of the day made it 4-3. In the 9th Reddick led off with a single and stole 2nd. But as with the rest of the day there was no getting a big hit for the Browns as Dozier, Abreu and Belt failed to get a hit or even a few productive outs. AB’s 4/7/0 Browns 3/6/0. Congratulations to Steve and the Bastards. I’m sure the match up with Brian will be awesome. Browns management will take the next week or two to decide if we will return for 2018. #1 and #4 Go 20! Pearl Harbor Remembrance Day set the backdrop for the top seed Shooting Stars II to host the #4 Speakers. Shooting Stars II topped OOTL with 53 regular season wins. The Speakers, fresh off a dramatic series against the Lemonheads, won 6 of the 10 meetings against the Stars this season. After losing the season opener, 15-10, the Speakers won 3. The Stars swept the 2nd Period series. The Speakers countered with an early 3rd Period sweep. Game 1 – Jake Arrieta and Clayton Kershaw both dominate through 6. Arrieta allows 2 singles and a double — all in different innings. Kershaw surrenders a 2-out double and hits 2 Speakers. Neither starter sees a runner reach 3rd base. Finally, with 1 out after the 7th inning stretch, Wilson Ramos picks on an Arrieta fastball and launches it out. Stars up 1-0. Ian Kinsler doubles into the gap with 1 out in the 8th, but Kershaw whiffs both Dansby Swanson and Kris Bryant to preserve the slim 1-run lead. Matt Belisle gets Yoenis Cespedes on a fly to right, then gives way to Aroldis Chapman after pinch hitter Mookie Betts is announced. Betts K’s. Anthony Rizzo flies to center to end the pitchers’ duel. Stars win, 1-0. Game 2 – Jeremy Hellickson makes his Speakers’ post-season debut against Jacob deGrom. Dustin Pedroia greets Hellickson with a lead-off solo shot in the bottom of the 1st. Hellickson coughs up a hit in each of the next 4 innings, but no runner reaches 3rd. The Speakers, still trying to spark their offense, leave runners in scoring position in the 3rd and 4th, but go 1-2-3 in the other 3 innings. Betts’ lead-off single in the 6th goes nowhere while Hellickson enjoys his first 1-2-3 inning in the bottom half. The Speakers go in order in the 7th. With 2 away in the bottom half, Ender Inciarte singles (9). Hellickson departs for Adam Libertore. Pedroia lashes a hit-and-run single (7). Libertore strikes out Ryan Schimpf to end the threat. The Speakers go in order in the 8th, still searching for their first run of the series. Pinch-hitter Yasmani Tomas doubles off Jeremy Jeffress to lead off the bottom of the inning. Pinch-runner Eduardo Nunez halts at 3rd on Matt Carpenter’s single (5). With runners on 1st and 3rd, Jeffress strikes out Hunter Pence. Ramos grounds sharply to short. The Speakers turn a 6-4-3 twin killing to stop another Stars’ threat. To this point, the Speakers have 6 hits and no runs through the first 17 innings of the series; and, only one Speaker runner has touched 3rd base. Will Harris starts the 9th. David Dahl laces a double. Cespedes doubles him home to tie at 1-1. Rizzo connects on a 2-run home run. Manny Machado strikes out (8). Carlos Gonzalez doubles. Harris plunks Andrelton Simmons, then heads for the showers, now down 3-1. Tyler Thornburg gives up RBI singles to Buster Posey (0-7) and Kinsler (5) before Thornburg retires the next 2 hitters. All of a sudden, the Stars are down 5-1. JJ Hardy leads off with a single (9) off Bartolo Colon. Travis Jankowski strikes out. Inciarte hits a harmless fly out to right. Pedroia, enjoying a perfect day to this point, flies to left (4-5, D, HR, RBI, R) to knot the series at 1-1 with the Speakers heading home for the next 2 games. Game 3 – Jose Quintana and Carlos Martinez match up at Riegle Park. Both begin shaky outings. Carpenter triples home Pedroia in the 1st. Chris Young and Cespedes doubles tie at 1-1 in the bottom half. The Speakers get Rajai Davis to 3rd (11, SB, 1-3) in the 2nd inning, but Thornburg takes over to strike out Young to end the inning. Bryant walks to lead off the bottom of the 3rd. After Cespedes and Rizzo K, Machado strokes a 2-run HR. Speakers up, 3-1. The Stars leave a runner on 1st in the 2nd through 4th innings and can’t cash in on 2 base runners in the 5th. Martinez is pumped after wriggling out of that jam and retires the next 9 Stars. Nunez boots a Davis grounder with 1 out in the bottom of the 6th. Posey grounds to short, sending Davis to 2nd with 2 away. Ramos commits a passed ball moving Davis to 3rd. Kinsler swings for the fences and clears the left field wall (6) for a commanding 5-1 lead. With 2 outs in the 8th, Jonathon Villar singles (11). Keon Broxton works a walk, signaling the end of Martinez’s day (7.2 IP, 5 H, 3 ER, 4 BB, 10 K). Roberto Osuna prevents a Ramos walk. Then Ramos drives a double down the line to score a pair. Jarrod Dyson tries to walk, but is denied. Then he flies out to left to end the inning at 5-3. Osuna returns in the 9th and is much more successful. Nunez flies to right. Both Jankowski and Inciarte whiff as the Speakers pocket a 5-3 victory and a 2-1 series advantage. Game 4 will always be remembered in OOTL post-season history. Trevor Cahill and Joe Ross start well, but both will be long gone before this classic is decided. The closest either team comes to an offensive threat is the Stars loading the bases with 2 outs in the 3rd. Ross calmly strikes out Aledmys Diaz to preserve the double shutout. Chapman takes over for Cahill in the bottom of the 7th. Cespedes doubles with 1 out, marking the Speakers first hit of the game! Javier Baez, making his first series appearance, pinch hits for Gonzalez. Baez drives what initially looks like a 2-run homer, but Chapman (+51) brings it back to an RBI double. Baez would stay at 2nd as the inning ends. Ross allows a lead-off single to Inciarte to begin the 8th. Nunez grounds him to 2nd. Pedroia doubles in the gap to re-tie the score at 1-1. Joe Blanton comes on and walks Diaz. Carpenter pops to short (8). Villar walks to load the sacks. Pence flies to left to prevent further damage. Game tied at 1-1. Free baseball brings the fans much more than they could have ever anticipated. The 9th and 10th are uneventful. Carpenter doubles (4) to start the 11th and to chase Libertore. Broxton pinch runs, but has to hold on Villar’s ground out to Machado. Pence is denied a walk by Jeffress, and then flies to shallow center. Broxton motors to 3rd on a Jeffress wild pitch. Ramos grounds weakly to 1st base to snuff another threat. Top 12: Dyson doubles (0-6). Inciarte bunts him to 3rd. Nunez tries to squeeze him home, but Posey applies the tag and hangs on to record the huge 2nd out. Nunez then doubles (turned back HR! ), but Brad Hand comes in to retire Pedroia on a pop to Simmons. Bottom 12: Belisle plunks Rizzo. Davis pinch runs and steals 2nd. Two come-backers and a strike out send us to the 13th. Diaz leads off with a double, the Stars third consecutive inning with a lead-off double. Osuna comes in to retire the next 3 batters in order. In the bottom half, Simmons reaches on Villar’s error, but is stranded at 2nd. Colon comes on as the last Speaker in the pen. Dyson greets him with a 1-out single in the 14th, but Posey nails him trying to steal. Betts walks to start the bottom half, steals 2nd, and moves to 3rd on Davis’ sacrifice. Betts is caught attempting to steal home. Then Cespedes strikes out. Both teams go 1-2-3 in the 15th. Francisco Cervelli, the Stars’ last first baseman, singles (9) to open the 16th. Villar doubles as Cervelli pulls up at 3rd. With the infield in, Pence pops up to Baez at 1st. (Infield deep would have been a DP!) Ramos pops to SS. Dyson grounds 3-1. Yet another threat averted. Bottom 16: Kinsler singles (7) with 1 away. Enter Brian Flynn, the Stars’ final available reliever. Bryant walks. Young pinch hits and lines out to Nunez (8). Davis whiffs. Colon walks Inciarte to open the 17th inning. Ender steals 2nd, but Nunez lines into a Kinsler unassisted DP. While the Speakers’ bats quiet into a 12-in-a-row outage, Cervelli strokes another single (8) with 1 out in the 18th. Villar singles (11), but Pence grounds into a 1-6-3 double play to erase another threat against the tiring Colon. Both teams mercifully go 1-2-3 in the 19th. The Stars repeat that pattern in the 20th. Cespedes hits a one-hopper to the mound to begin the bottom half. Baez walks. As Baez breaks for 2nd, Machado singles (8) against Flynn (now base grade 11). With 1st and 3rd and 1 out, Simmons slaps an RBI single (8) to send the Riegle Park fans home happy. The Speakers prevail, 2-1 in 20 innings, while getting out-hit 14-6. We wonder how many fans on the East Coast stayed up for the conclusion of this game. Game 5 – With both pens in tatters, Kershaw and Arrieta would be counted on to go deep into this one as play returns to the Stars’ home park. Swanson starts fast with a double. Bryant loses a chance to walk, but then doubles home Swanson. Kershaw turns back a home run (+35). The Stars offense finally gets back in gear in the 4th. Carpenter’s lead-off walk turns into the game’s first run. Villar singles (11). Arrieta uncorks a wild pitch. Ramos and Broxton each lift a sac fly to center. Jankowski walks to begin the 5th. Pedroia doubles him home. Inciarte, who enters defensively, doubles to start the 7th. Pedroia doubles him home to give Kershaw a 4-1 lead. Broxton walks to lead off the 8th. With Broxton on the move, Dyson singles (10). On another hit-and-run, Nunez swings through the pitch and Jett Bandy throws through. Kinsler steps forward and throws to 3rd to nab Broxton diving back. Nunez grounds to Simmons, moving Dyson to 2nd. Inciarte provides the clutch RBI single (7) to complete the scoring. In two starts, Kershaw (17 IP, 6 H, 1 ER, 0 BB, 25 K) totally dominates and wins twice. Speakers up 3 games to 2 and heading back home for another potential clincher. Both teams get some bullpen arms rested. Game 6 – deGrom and Hellickson each set the opponents down in order through 2. Villar singles (9) leading off the 3rd. Jankowski singles (10). Inciarte flies to shallow left. Pedroia walks to load the bases. Schimpf grounds into a 4-6-3 DP. With 1 out in the bottom of the inning, Posey singles (7). Kinsler strikes out. Dahl singles (10). deGrom gives way to Chapman to face Betts, who rips a 2-run double (turned back HR). The Speakers take the early lead, 2-0. Hellickson retires 9 straight Stars following the big double play to end the 3rd. Simmons gets a 2-out single (0-7) with Rizzo on base in the 4th, but the Speakers come up empty as Posey flies out to LF. Diaz starts the Stars’ 7th with a single (7). Hellickson out; Hand in. Tomas pinch hits and forces Hand to bobble a spinning two-hopper for an E-1. Hand hits Pence with a pitch and departs with the bases juiced. Jeffress gets Ramos on a 4-6-3 DP with a run scoring. Jeffress walks Villar, but Jankowski pops up to end the inning with the score, 2-1, Speakers. With their backs against the wall, the Stars try to keep their season alive in the 9th. Nunez doubles (turned back HR). Tomas misses 2 bunt attempts, but then successfully sacrifices Nunez to 3rd. Pence laces an RBI single (7) to knot the score at 2-2 and hang a blown save on Jeffress. Blanton comes in to get Ramos and Villar to close out the inning. Machado doubles (5) off Belisle to lead off the bottom half. Gonzalez singles (9) to short right. Machado pulls up at 3rd with no outs. Davis pinch runs at 3rd as Thornburg takes the hill to save the Stars’ season. Thornburg strikes out Simmons. Posey steps in and ends the game and series (66-0-6) with a walk-off RBI single. Speakers win 3-2 and take the series, 4-2. The #5 seed Lemonheads and #4 Speakers settled their playoff series on Wednesday, November 29th. The Lemonheads ended strong to earn the final post-season spot while the Speakers sputtered down the regular season stretch. Game 1 – Carlos Martinez sets down the ‘Heads 1-2-3 in the 1st. Lemonheads starter Drew Pomeranz doesn’t fare as well. Dansby Swanson leads off with a ringing single (10). Kris Bryant follows with a 2-run home run, equaling 50% of his entire regular season total! Charlie Blackmon doubles to lead off the 3rd, but never advances beyond 2nd base. That’s the only hit allowed by Martinez until the 6th. With 2 away, Daniel Murphy legs out a triple. Nellie Cruz follows with a clutch RBI single (9) to bring the ‘Heads closer, 2-1. Bob’s Lemonheads threaten again in the 7th with 2 outs. Adam Duvall doubles. Martinez intentionally passes Blackmon, and then departs in favor of Jeremy Jeffress. Xander Bogaerts pops to Manny Machado to end the threat. In the bottom of the 8th, Yoenis Cespedes rips a 2-out ball off the top of the left field fence. Former teammate, Jeurys Familia (+62) denies the insurance solo. Carlos Gonzalez hits a harmless fly to left off Dan Jennings to carry a slim 1-run margin to the 9th. Jeffress sets down Hernan Perez, JD Martinez and Jake Lamb in a row to earn the save. In fact, Jeffress retires all 7 Lemonheads he faces to preserve the 2-1 win for the Speakers. The first two batters Pomeranz faces determines the outcome. Game 2 – The Lemonheads break out in a big way, scoring in each of the first 4 innings to take a commanding 5-1 lead. Trevor Story and Cruz each go deep against Jake Arrieta, who allows 10 hits and 8 ER. Brad Hand mops, but doesn’t fare any better, coughing up 3 hits in 0.2 IP. The ‘Heads easily knot the series at 1-1 with a resounding 8-3 thrashing. Plus, the Lemonheads will enjoy home cooking for the next two games. Game 3 – David Price took a page from Arrieta’s playbook by serving up 10 hits and 4 long balls, including 3 in the 1st inning! Meanwhile, Alex Reyes puts on a clinic (9 IP, CG ShO, 4 H, 1 BB, 16 K!) by not allowing a Speaker to 3rd base. Neil Walker, Murphy, Cruz and Duvall all homer. Lemonheads take a 2-1 series lead with a 5-0 blanking. Game 4 – After Ian Kennedy and Joe Ross set down the opposition in order in the 1st, both offenses take off in the 2nd. Anthony Rizzo slaps a lead-off single by SS (RP-10). Machado then launches a 2-run HR to shatter the Speakers 11-inning scoreless streak. Gonzalez singles to right where Martinez misplays the ball. Buster Posey eventually lifts a sac fly to right for a quick 3-0 advantage. The Lemonheads answer in the bottom half. Lamb walks with 1 out. Story rips his second triple of the series, and then scores on Duvall’s RBI single (8). Both teams keep the pressure on the pitching, but both come up empty over the next 4 innings. Ian Kinsler coaxes a 7th inning lead off walk. After Mookie Betts grounds to SS, pinch hitter Swanson reaches on a Story overthrow. Cespedes walks prior to Rizzo’s 2-run triple. Gonzalez singles in Rizzo with 2 outs to complete a 4-run inning. Both Posey and Cespedes homer in the 8th for a 10-2 Speakers lead. However, the ‘Heads weren’t giving up. Story goes yard with Lamb aboard in the 8th. They then start the bottom of the 9th with 3 straight singles before Bartolo Colon records the final out, 10-5. Game 5 – With the series even, Game 1 starters warm up for the clincher at Riegle Park. Martinez gets 3 fly balls in the 1st. Pomeranz again faces early trouble. Swanson singles (10). Bryant singles and moves to 2nd on another JD Martinez error. Chris Young singles home both for an early 2-0 Speakers lead. Over the next 5 innings, the Lemonheads strand a runner at 2nd and ground into a pair of double plays. They finally break through against Hand in the 6th. Story walks for the 2nd time in the game. With 2 outs, JT Realmuto strokes a 2-run, game-tying home run! The ‘Heads then restart the stranding pattern. Martinez is left at 2nd after an 8th inning double. In the 10th, 1st & 3rd with no outs and Murphy lines into a 3-unassisted double play! Both teams begin to empty their pens. Duvall gets the best of Roberto Osuna in the 11th. Adam’s homer gives the Lemonheads a 3-2 lead. In the bottom half, Sammy Solis walks Kris Bryant. Rajai Davis pinch runs and scores easily on Cespedes’ RBI double. However, the Speakers strand Yoenis at 3rd, so we continue to the 12th at 3-3. The Lemonheads leave runners at 1st & 2nd, foiled by a turned back walk and Cruz’s bid for a single snuffed out by Joe Blanton. In the 13th, Story’s 2-out 11-4 becomes a 7 and Story never gets past 1st base. David Dahl barrels a line single (7) off Jennings to begin the bottom of the 13th. Dahl then steals 2nd. Davis bunts, but the Lemonheads snuff out Dahl at 3rd. Cespedes finally walks off by connecting on a 2-run game-winning, series-ending home run. Jennings (+61) rolls 63 to eliminate the opportunity to get Davis at the plate on a double. Speakers win 5-3 in 13. Cespedes would have to be the Speakers series MVP. Duvall had a heck of a series for the Lemonheads. He even knocked in a run in the only game where he didn’t collect a hit. Story also had a great series in limited play. This was a heartbreaking loss for the Lemonheads. Fortunately, we enjoyed Mother’s subs and adult beverages with Manager Steve to soften the blow.